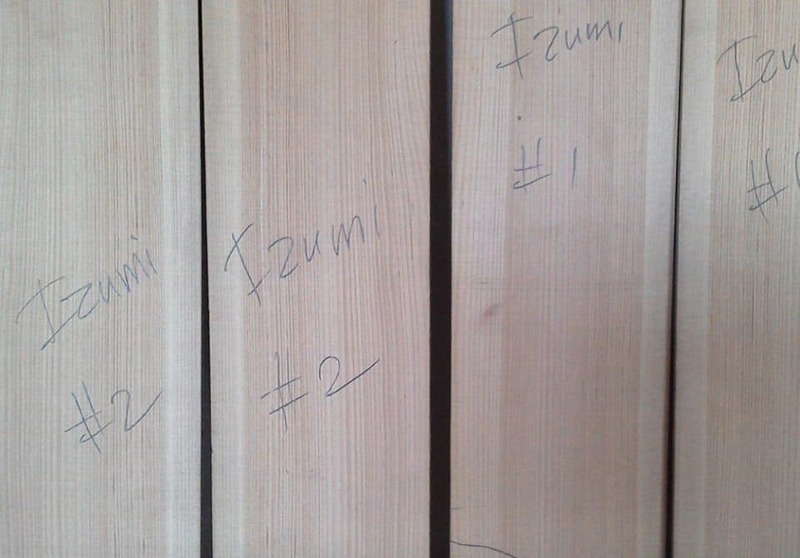 The Melody of Hinoki as told by an American Guitar Maker in Japan | Bartok design Co. The Melody of Hinoki as told by an American Guitar Maker in Japan – Bartok design Co. When we came across an American guitar maker, living in Japan, using native Japanese wood to make guitars, we knew we had to get in touch! Stephen Faulk of Stephen Faulk Guitars kindly answered our questions and shared his story, along with these photos. 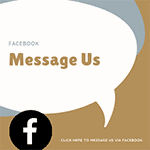 I know he would love to hear from you if you enjoy this article. I’ll add all the links at the end. We asked Stephen about the merits of Japanese hinoki for musical instruments. When I first learned that I could find Hinoki in the lumber yards in Japan that had similar qualities to cypresses form the Mediterranean area I was very excited. 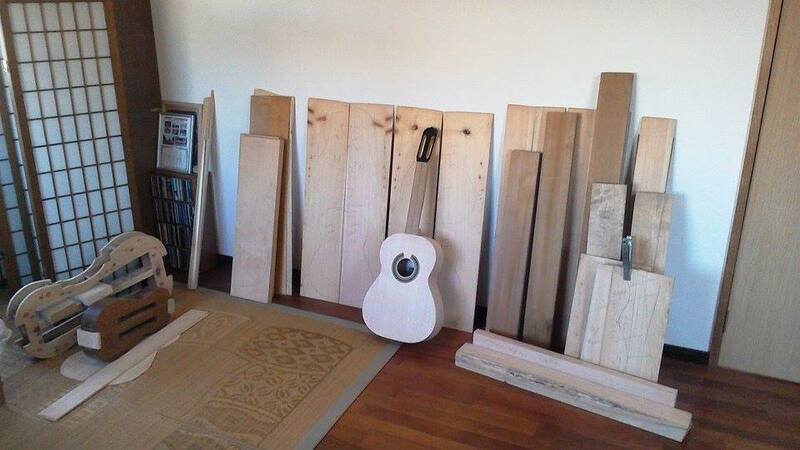 I had known about Hinoki for many years, but it’s not readily available in California where I began making guitars. 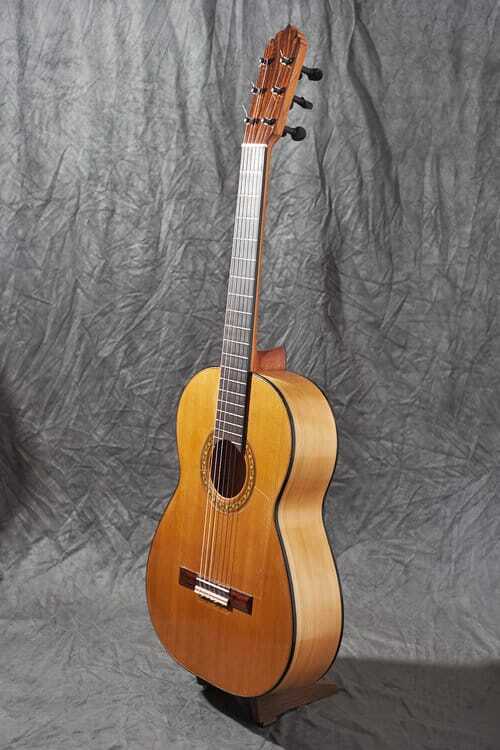 The cypress makes excellent ‘classical’ guitars which are a modern variant of the traditional Spanish guitar. Before about the mid-20th century there was no distinction between the classical guitar and the flamenco guitar, both instruments were virtually interchangeable. Later as classical guitar playing emerged as an art form separate from flamenco, Spanish folk music and other kinds of guitar music, the darker rosewoods came to be favored by the makers and the musicians. However, the appeal of the dry sound of cypress never went away and stayed popular with flamenco guitarists and other musicians. 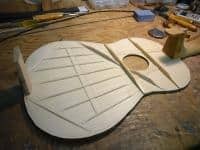 Today the cypress guitar is seeing a bit of a comeback as a wood used for classical guitar construction due to changing tastes. Musicians are now more aware of the tradition of using Cypresses in guitar construction in Spain when the ‘Torres’ style guitar developed. I use hinoki in the same way I use the traditional cypresses I buy from European, Mexican or American suppliers, but I like it also because it is locally sourced. I have made many guitars with the rosewoods, but as a maker my personal taste is to make ‘blonde’ classical guitars.’Blonde’ guitars that are not made with dark rosewoods. Of course, I do make rosewood guitars, but make more guitars with lighter woods like Maple, Cypress, Hinoki and Lawson Cypress than most makers today. The hinoki is a good guitar wood because it has the attributes that the late 19th-century Spanish makers liked about cypress. It’s lightweight and low density, which encourages vital resonance in the guitar. In general, it creates a warm dry sound and the sustain is crisp. It makes guitars that are good for playing dense richly harmonized music like Bach. 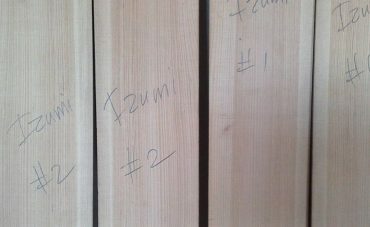 Since the hardness and density of wood varies from region to region and tree to tree, I select the best Hinoki for guitar making by making sure it is not too soft. I like a board of hinoki that it difficult to drive your thumbnail into, hard medium dense Hinoki makes fantastic guitars. 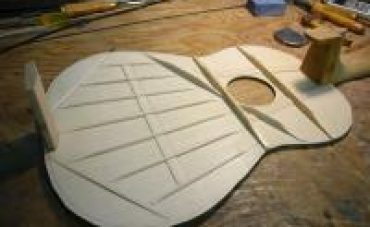 I use hinoki to construct the backs and sides of the guitar, like the old Spanish makers. I use either spruce or cedar for the top of the guitar. The neck is made Cuban Cedar or Cedrella which is usually from Central America and must be specially imported. The hinoki boards I select must be carefully cut by a skilled sawyer, with a big band saw. I work with them to ensure the wood is properly quartersawn for guitar use. Q. Do you use any other native Japanese woods? Yes, I fact I do use Red Oak from Kyushu to make some of my specialized guitar maker tools like binding cutters and ‘violin makers’ knives. Many tools used in the art and craft of making musical instrument must be made by the luthiers themselves, usually after their teacher shows them the tools and says your assignment is to construct your own set of special tools and knives! Of course, today may things can be purchased online in specialty shops but when I began this was not as possible as it is today. I had to begin by making most of my guitar specific tools. 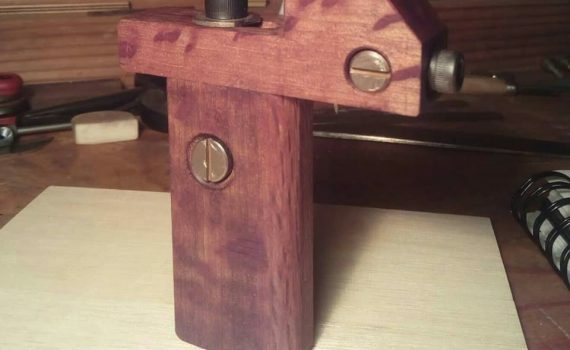 A tool made of Kyushu Red Oak, the tool is a binding channel cutter. I like Kyushu Red Oak because it’s hard enough to be durable for life and it’s also smooth and doesn’t mar the work. This kind of oak is also used to make martial arts weapons for Okinawan karate. I’m interested in native woods for guitar making too, such as Keyaki and Sakura. I’ve made a beautiful guitar about of 90-year-old Persimmon that I took from an old broken tansu. 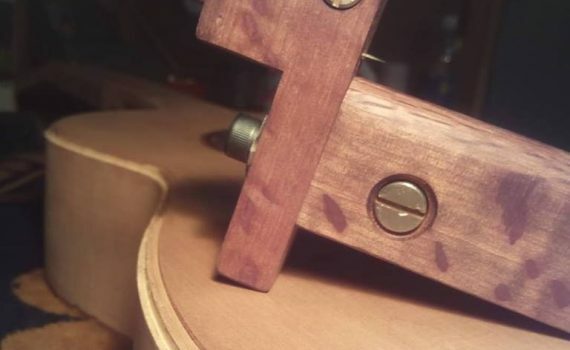 Sakura is a fruitwood and used to be common in European instruments from the late middle ages to the baroque era, often used as bridges on lutes and guitars, but also for pegs and fingerboards. I have used Kagoshima Sakura wood for bridges on my guitars. It’s a wonderful bridge wood, and would make great guitars if you can find a tree big enough that needs to be cut down. My instrument construction training began when I was in high school. I played the cello in the school orchestra and also played the guitar. When it happened that my cello needed some repairs the band teacher sent me to Mr Tenney who was a violin repairer and bowmaker in Redlands California. I took my cello over to his shop to have a crack fixed and to get new strings and I was hooked within five minutes of entering the shop with all the activity going on there. On one wall there was an enormous painting by a Spanish artist who lived in France in the 1840’s called Narcisse Diaz de la Pena, he is well known, under the painting was a Beethoven era piano built in the 1820’s and on the top of the closed piano were five or six Italian violins laying on a small Persian rug. There were violin bows being made and old master paintings being restored and antique furniture everywhere. Mr Tenney and his wife owned an antique shop, which his wife Betty ran. Mr Tenney employed me after school to move antiques, clean the shop and to strip and refinish furniture. Soon he let me help him do instrument repair work, learn more about woodworking tools and try to build some instruments myself. 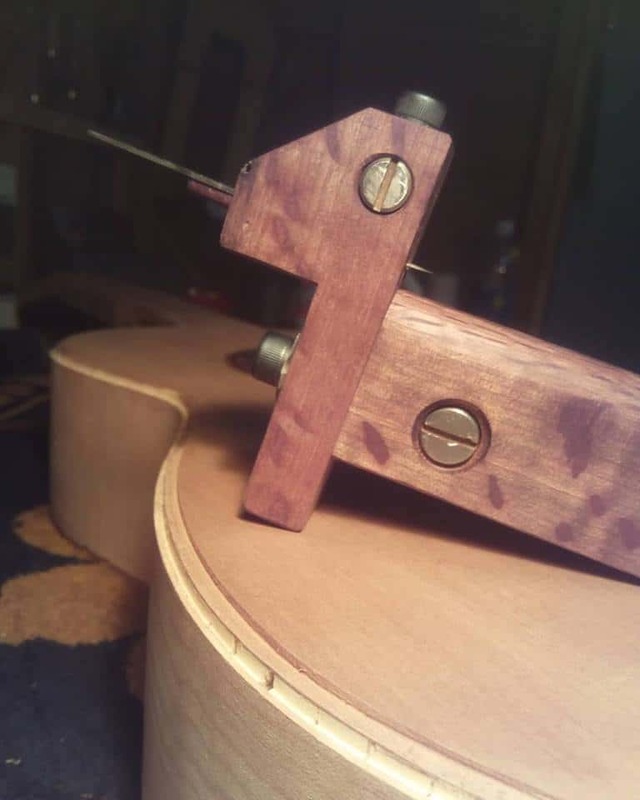 I built some cello and bass bows and learned a great deal about paintings antiques, architecture and violin making in his workshop. I worked for the Tenney’s for about three years and then I went to college to study. I remained friends with the Tenney’s over the next 25 years visiting them often. I went to college at the San Francisco Art Institute and graduated with a degree in sculpture. After that program, I was accepted into the Graduate Studies Art Dept at Mills College in Oakland California. I finished the master’s degree course in studio art and art history. After the time in the academic setting, I wanted to make instruments and work on a career in visual arts. In 1997 I began to study under two instrument makers in the San Francisco area, one was Eugene Clark a notable guitar maker who was thought highly of in the classical/flamenco guitar world for his depth of knowledge of traditional Spanish guitar making concepts. And the other was historical Lute maker Mel Wong, who is still active in San Francisco. Unfortunately, Gene Clark died a few years ago. I worked and studied concurrently with Mel and Gene for two years going back and forth between their shops doing projects, learning about guitar and lute repair and construction. 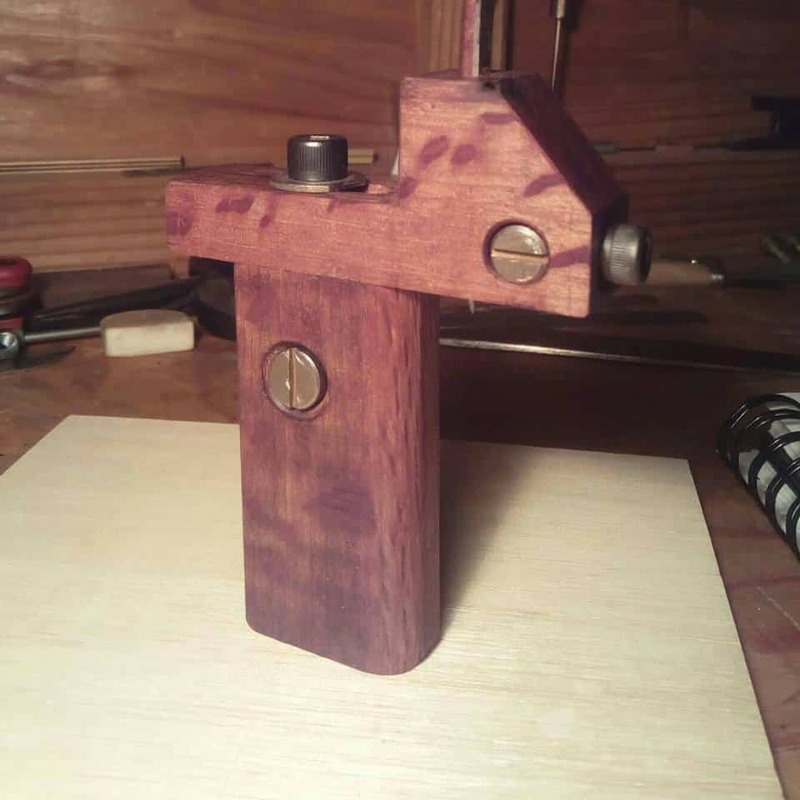 After that time I opened a small workshop of my own in Oakland CA. In 2006 and 2011 I did a year of additional training on steel string guitar repair with Stewart Port who is master guitar repairman in Oakland CA who specializes in rare and vintage steel string guitars. I had my own guitar making shop open at that time and Stewart Port and I are both former students of Eugene Clark. I maintained a guitar repair and building shop in Oakland until 2013 when I moved to Japan with my wife who is native Japanese. We met in CA where she had lived for many years. She works in the graphic design business and does bilingual Japanese/English web design as a freelancer. The move was prompted by the unfortunate death of her mother in 2012. We came to Akune in Kagoshima to help her dad and keep him company. I moved my guitar making shop to Akune into a former salt supply warehouse and began making guitars for my remaining US customers. Final thoughts: We have to ask – Are there any onsen in your area? Hinoki ofuro? In Akune, where we live, there is a tradition of putting Bontan, a locally grown type of giant Pomelo citrus in the baths. It makes the room fragrant. There was an onsen here that had a hinoki tub, but they had to close down two years ago. Akune also has a natural saltwater geothermal onsen! 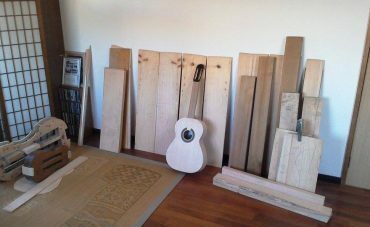 Thank you so much, Stephen, for your detailed comments and for sharing your passion for wood and guitar building so openly. If anyone wants to reach Stephen you can contact him via his website Stephen Faulk Guitars and make sure you take a look at his Japanese persimmon guitar on YouTube.